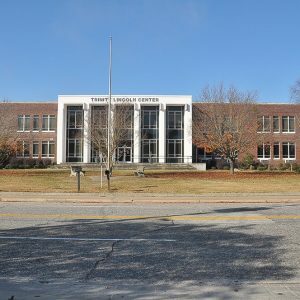 Lincoln High School was established in the 1930s as the high school for African American students in the city of Sumter. The building occupies the former site of a schoolhouse for African American students dating from 1874, referred to as “Lincoln School.” The core of the high school building that remains today was constructed in 1937. It was later expanded in 1952 with the addition of two large wings. A significant alteration was made to the building c. 1967 — a two-story white stucco façade that offers the appearance of columns was added to the main entrance of the building.